Home > Blog > WordPress Guides > How Can I Optimise My WordPress Post or Page for the Search Engines? Author: Martin Malden Published: December 28, 2015. Last updated: April 10, 2019. If your website is based on WordPress you already have a good start as far as optimising your posts and pages for the search engines goes. But there are some simple things you can do to give your content an extra boost. Before we go too far let me make an important point: when you’re writing articles (posts or pages), write for people. Do not write for the search engines..! I discussed some of the principles behind Search Engine Optimisation (including that point I’ve just made) here, so take a moment to read through that page – it will give you some useful background information. But now let’s look a bit more closely at some specific steps you can take when you’re writing your posts or pages. META tags and semantic tags – what are they? They are both ways of giving the search engines information about the content on your page. META tags tell the search engines what content the page contains and how they should treat it. Semantic tags tell the search engines how the content appears visually to readers – i.e. whether the content is a heading or sub-heading, whether the text is bolded or italicised, whether you’re using a bullet point list or a numbered list, and so forth. You need to be using both types of tags in the right way in order to optimise your article for the search engines. Let’s start with META tags, since these are both constant and easy to set up. I’ve already touched on two of them: the SEO title and the META description. I wrote two articles about them here and here, so it would be worth reading those, because they are both important META tags. You should set up those two tags by default on every post or page you write. But there are a couple of other tags that you can use that will give you some control over how the search engines treat your page. The noindex tag tells the search engines that they must not return the page it appears on in any of the search results. Normally you would want the search engines to return your article (page or post) in the search results so you would not use this tag. In fact, if you want your page to be indexed you don’t need to use any tag because the default setting is index. Because it’s the default you don’t need to add it. The nofollow tag tells the search engines not to follow any of the links on the page with which it’s associated. What do we mean by not following links? Well, by linking to another site you are providing some credit to it, which would benefit its search ranking. You may not want to do that, so you would apply the nofollow tag to links from your page to other sites. That would tell the search engines not to follow the link to the other site, but readers would still be able to click through to it. But you probably would want the search engines to follow links from your page to other pages on your site – so you would not want to use the nofollow tag on those links. As with indexing, the default setting is to follow links, so where you want this setting you don’t need to do anything. So whether or not you would use nofollow as the default setting on your pages and posts depends on the content you write and whether you mostly link to other pages on your site, or to other sites. If you mostly link to other pages on your site then do not use the nofollow tag as the setting for the page. That will help the search engines to find and index as many pages as possible on your site – usually a good thing! How do I set these tags? Luckily it’s very easy to do. You can see that the check boxes for noindex and nofollow are not checked – that is the default setting. So if you want the search engines to index your page and follow the links you do not need to do anything. If you do not want the search engines to index this page you would check the noindex checkbox and likewise the nofollow checkbox if you did not want the search engines to follow links from your page. There are certain types of page that you would probably want to prevent the search engines from indexing – for example, pages that are for site members only, or pages from where people can download products. These are the sorts of pages where you would set the noindex and nofollow tags. Semantic tags, as I said earlier, tell the search engines how your content appears visually to readers. 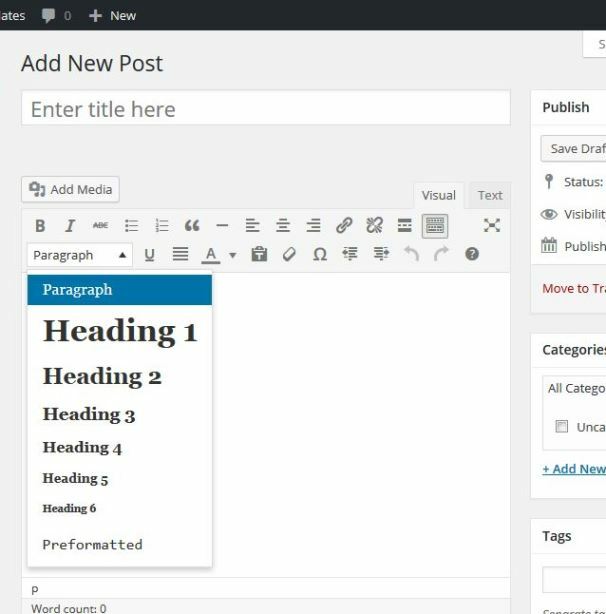 Luckily the Visual view of the window in which you write your content in WordPress has 2 rows of buttons at the top that enable you to format your article. Using these buttons will result in WordPress applying the correct tags. But there are two formatting options that I’ve seen people doing manually rather than using the WordPress formatting buttons. And they can make a difference to how your page figures in the search results. A properly structured page uses headings and sub-headings to provide a framework of the article for site visitors. They enable the reader to scan the article for the sections that are of the most interest to them. In Microsoft Word these are defined using the ‘Heading 1’, ‘Heading 2’ buttons in the ribbon across the top. In websites they are defined by using <h> tags: <h1> for ‘Heading 1’, <h2> for ‘Heading 2’ and so on. It’s important to use these <h> tags rather than simply making the text bold to indicate a heading, because the search engines interpret them differently from bolding tags. Part of assessing the quality of a page is based on whether it has been structured well – and the <h> tags are an important indicator of that to the search engines. Selecting the appropriate heading from the drop down menu will cause WordPress to apply the correct tags. In WordPress, the page (or post) title is automatically assigned an <h1> tag and, since a website page should only contain one <h1> tag, you should not use ‘Heading 1’. You can use all the other ‘Heading’ tags but remember to use them in a hierarchical fashion. For example: Heading 3’s should directly relate to their parent Heading 2. As I said earlier: it’s important to use these tags rather than simply making the text of headings bold, because the search engines interpret them differently and they are an important indicator of the quality of the page (to the search engines). The same logic goes for lists. Lists work well online because they are clear and easy to follow. But I’ve seen people create lists manually rather than using the list function in WordPress. Again, the search engines interpret the tags that identify lists differently from text that is simply indented with a series of numbers against each point. In the toolbars at the top of the window in which you write your content there are buttons for both bulleted and numbered lists – use them..! 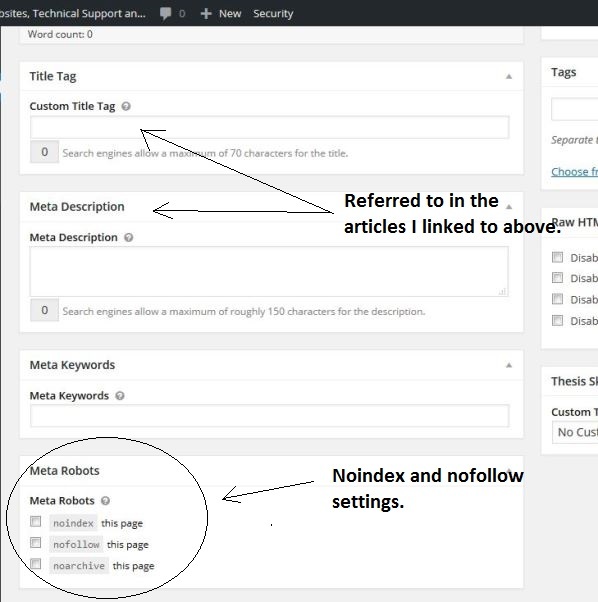 WordPress will apply the correct tags and that will help your article do better in the search results because they will tell the search engines that you’ve structured your content well. OK, that’s it. Using the META and semantic tags correctly will help your content figure higher in the search results and using them is not difficult – WordPress takes all the code headaches away, but make sure you use all the functionality it provides, and use it correctly!